Decades of plowing have depleted organic carbon stocks in many agricultural soils. Conversion of plowed fields to pasture has the potential to reverse this process, recapturing organic matter that was lost under more intensive cropping systems. Systems are being put into place to provide payments for practices that increase soil carbon. Pastures in the northeastern USA are highly productive and could act as significant sinks for carbon dioxide. However, such pastures have relatively high shoot relative to root growth, the majority of which is removed as hay or consumed by grazing animals. In addition, the ability of pastures to sequester carbon dioxide decreases over time as previously depleted stocks are replenished and the soil returns to equilibrium conditions. 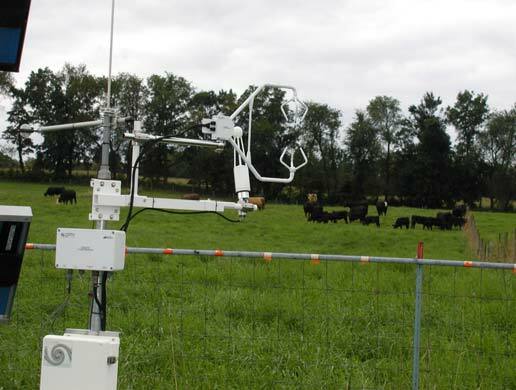 We have monitored carbon dioxide (CO2) gains and losses from two fields in Central Pennsylvania that have been managed as pastures for at least 40 years. When biomass removal as hay or by grazing was taken into account, the pastures experienced a net loss to the atmosphere of about 1.4 ton CO2 acre-1 year-1 (positive values represent loss to the atmosphere while negative values represent uptake by the pastures). Returning manure from the hay that was consumed off site would have partially replenished the lost carbon, but the pastures would have still experienced a net loss of CO2. Heavy utilization of the biomass produced on these mature pastures prevented them from acting as carbon sinks. Although good management practices following conversion to pastures can increase soil carbon sequestration, land managers must realize that limits exist to the amount of carbon that can be stored. Mature pastures and those that are heavily utilized, either by haying or grazing, can not be counted on to continuously accumulate soil carbon.